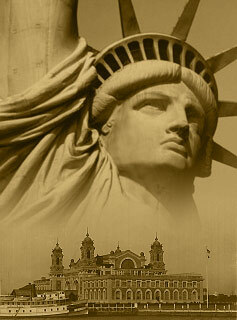 Ellis Island was incorporated as part of the Statue of Liberty National Monument on May 11, 1965. Between 1892 and 1954, approximately 12 million steerage and third class steamship passengers who entered the United States through the port of New York were legally and medically inspected at Ellis Island. Reopened on September 10, 1990 after a massive restoration, the Main Building on Ellis Island is now a museum dedicated to the history of immigration and the important role this island claimed during the mass migration of humanity in the late 19th and early 20th centuries. late 19th and early 20th centuries. Before being designated as the site of one of the first Federal immigration station by President Benjamin Harrison in 1890, Ellis Island had a varied history. The local Indian tribes had called it "Kioshk" or Gull Island. Due to its rich and abundant oyster beds and plentiful and profitable shad runs, it was known as Oyster Island for many generations during the Dutch and English colonial periods. By the time Samuel Ellis became the island's last private owner in the 1770's, the island had been called Kioshk, Oyster, Dyre, Bucking and Anderson's Island. In this way, Ellis Island developed from a sandy island that barely rose above the high tide mark, into a hanging site for pirates, a harbor fort, ammunition and ordinance depot named Fort Gibson, and finally into an immigration station. From 1794 to 1890 (pre-immigration station period), Ellis Island played a mostly uneventful but still important military role in United States history. When the British occupied New York City during the duration of the Revolutionary War, its large and powerful naval fleet was able to sail unimpeded directly into New York Harbor. Therefore, it was deemed critical by the United States Government that a series of coastal fortifications in New York Harbor be constructed just prior to the War of 1812. After much legal haggling over ownership of the island, the Federal government purchased Ellis Island from New York State in 1808. Ellis Island was approved as a site for fortifications and on it was constructed a parapet for three tiers of circular guns, making the island part of the new harbor defense system that included Castle Clinton at the Battery, Castle Williams on Governor's Island, Fort Wood on Bedloe's Island and two earthworks forts at the entrance to New York Harbor at the Verrazano Narrows. The fort at Ellis Island was named Fort Gibson in honor of a brave officer killed during the War of 1812. Prior to 1890, the individual states (rather than the Federal government) regulated immigration into the United States. Castle Garden in the Battery (originally known as Castle Clinton) served as the New York State immigration station from 1855 to 1890 and approximately eight million immigrants, mostly from Northern and Western Europe, passed through its doors. These early immigrants came from nations such as England, Ireland, Germany and the Scandinavian countries and constituted the first large wave of immigrants that settled and populated the United States. Throughout the 1800's and intensifying in the latter half of the 19th century, ensuing political instability, restrictive religious laws and deteriorating economic conditions in Europe began to fuel the largest mass human migration in the history of the world. It soon became apparent that Castle Garden was ill equipped and unprepared to handle the growing numbers of immigrants arriving yearly. Unfortunately compounding the problems of the small facility were the corruption and incompetence found to be commonplace at Castle Garden. The Federal government intervened and constructed a new federally operated immigration station on Ellis Island. While the new immigration station on Ellis Island was under construction, the Barge Office at the Battery was used for the processing of immigrants. The new large structure on Ellis Island was built of "Georgia pine" with a slate roof and its doors opened on January 1, 1892. A fifteen year-old lass from Ireland named Annie Moore accompanied by her two brothers entered history and a new country as she was the very first immigrant to be processed at Ellis Island. Millions more were soon to follow. While there were many reasons to emigrate to America, no reason could be found for what would occur only five years after the Ellis Island Immigration Station opened. During the evening of June 14, 1897, a fire on Ellis Island, burned the immigration station completely to the ground. Although no lives were lost, many years of Federal and State immigration records dating back to 1855 burned along with the pine buildings that failed to protect them. The United States Treasury quickly ordered the immigration facility be replaced under one very important condition. All future structures built on Ellis Island had to be fireproof. On December 17, 1900, the new Main Building was opened and 2,251 immigrants were received that day. While most immigrants entered the United States through New York Harbor (the most popular destination of steamship companies), others sailed into many ports such as Boston, San Francisco and Savannah. The great steamship companies like White Star, Red Star, Cunard and Hamburg-America played a significant role in the history of Ellis Island and immigration in general. First and second-class passengers who arrived in New York Harbor were not required to undergo the inspection process at Ellis Island. Instead, these passengers underwent a cursory inspection aboard ship; the theory being that if a person could afford to purchase a first or second class ticket, they were less likely to become a public charge in America due to medical or legal reasons. The Federal government felt that these more affluent passengers would not end up in institutions, hospitals or become a burden to the state. However, first and second-class passengers were sent to Ellis Island for further inspection if they were sick or had legal problems. This scenario was far different for "steerage" or third class passengers. These immigrants traveled in crowded and often-unsanitary conditions near the bottom of steamships with few amenities, often spending up to two weeks seasick in their bunks during rough Atlantic Ocean crossings. 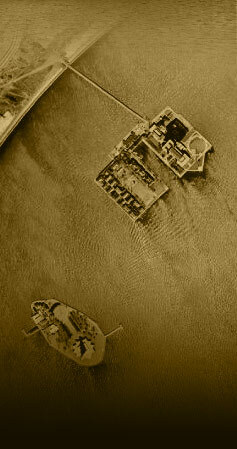 Upon arrival in New York City, ships would dock at the Hudson or East River piers. First and second class passengers would disembark, pass through Customs at the piers and were free to enter the United States. The steerage and third class passengers were transported from the pier by ferry or barge to Ellis Island where everyone would undergo a medical and legal inspection. If the immigrant's papers were in order and they were in reasonably good health, the Ellis Island inspection process would last approximately three to five hours. The inspections took place in the Registry Room (or Great Hall), where doctors would briefly scan every immigrant for obvious physical ailments. Doctors at Ellis Island soon became very adept at conducting these "six second physicals." By 1916, it was said that a doctor could identify numerous medical conditions (ranging from anemia to goiters to varicose veins) just by glancing at an immigrant. The ship's manifest log (that had been filled out back at the port of embarkation) contained the immigrant's name and his/her answers to twenty-nine questions. This document was used by the legal inspectors at Ellis Island to cross-examine the immigrant during the legal (or primary) inspection. The two agencies responsible for processing immigrants at Ellis Island were the United States Public Health Service and the United States Bureau of Immigration (now known as the Immigration and Naturalization Service - INS). During the early 1900's, immigration officials mistakenly thought that the peak wave of immigration had already passed. Actually, immigration was on the rise and in 1907, more people immigrated to the United States than any other year; approximately 1.25 million immigrants were processed at Ellis Island in that one year. Consequently, masons and carpenters were constantly struggling to enlarge and build new facilities to accommodate this greater than anticipated influx of new immigrants. Hospital buildings, dormitories, contagious disease wards and kitchens were all were feverishly constructed between 1900 and 1915. As the United States entered World War I, immigration to the United States decreased. Numerous suspected enemy aliens throughout the United States were brought to Ellis Island under custody. Between 1918 and 1919, detained suspected enemy aliens were transferred from Ellis Island to other locations in order for the United States Navy with the Army Medical Department to take over the island complex for the duration of the war. During this time, regular inspection of arriving immigrants was conducted on board ship or at the docks. At the end of World War I, a big "Red Scare" spread across America and thousands of suspected alien radicals were interred at Ellis Island. Hundreds were later deported based upon the principal of guilt by association with any organizations advocating revolution against the Federal government. In 1920, Ellis Island reopened as an immigration receiving station and 225,206 immigrants were processed that year. Ellis Island still remained open for many years and served a multitude of purposes. During World War II, enemy merchant seamen were detained in the baggage and dormitory building. The United States Coast Guard also trained about 60,000 servicemen there. In 1954 the last detainee, a Norwegian merchant seaman named Arne Peterssen was released, and Ellis Island officially closed. In 1965, President Lyndon Johnson declared Ellis Island part of the Statue of Liberty National Monument. Ellis Island was opened to the public on a limited basis between 1976 and 1984. Starting in 1984, Ellis Island underwent a major restoration, the largest historic restoration in U.S. history. The Main Building was reopened to the public on September 10, 1990 as the Ellis Island Immigration Museum. Today, the museum receives almost 2 million visitors annually. The Statue of Liberty was dedicated October 28, 1886. The grand statue was a gift to the people of the United States from the people of France over one hundred years ago in remembrance of shared blood shed in the American Revolution. Frederic Auguste Bartholdi was commissioned to design a sculpture to commemorate the American Declaration of Independence at the 1876 centennial. America and France agreed on a joint effort, the French Artisans would build the Statue in Paris and assemble it here in the United States on a pedestal designed and built by American craftsmen. In France, public funding, various forms of entertainment, and a lottery were among the methods used to raise funds. In the United States, benefit theatrical events, art exhibitions, auctions and prize fights assisted in providing needed funds. Meanwhile in France, Bartholdi required the assistance of an engineer to address structural issues associated with designing such as colossal copper sculpture. Alexandre Gustave Eiffel (designer of the Eiffel Tower) was commissioned to design the massive iron pylon and secondary skeletal framework which allows the Statue's copper skin to move independently yet stand upright. Back in America, fund raising for the pedestal was goi	ng particularly slowly, so Joseph Pulitzer (noted for the Pulitzer Prize) opened up the editorial pages of his newspaper, "The World" to support the fund raising effort. Pulitzer used his newspaper to criticize both the rich who had failed to finance the pedestal construction and the middle class who were content to rely upon the wealthy to provide the funds. Pulitzer's campaign of harsh criticism was successful in motivating the people of America to donate. While construction of the statue was nearing completion in France, little was happening on the American side of the Atlantic. The American press continued to be critical of the project, especially of its cost. They simply couldn't understand why the pedestal for the statue should cost as much as the statue itself. Congress rejected a bill appropriating $100,000 for the base. New York did approve a grant of $50,000, but the expenditure was vetoed by the governor. Many Americans outside of New York considered it New York's statue. "Let New York pay for it," they said, while America's newly rich self-made millionaires were saying and contributing nothing. The American half of the Franco-American Union, led by William M. Evarts, held the usual fund-raising events, but public apathy was almost as monumental as the statue itself. By 1884, after years of fund-raising, only $182,491 had been collected, and $179,624 had been spent. It took the intervention of Joseph Pulitzer and the power of the media to make a difference. Joseph Pulitzer was a Hungarian immigrant who fought in the Civil War, be-came a successful journalist, and married a wealthy woman. In 1883, when he bought a financial newspaper called the World, he already owned the St. Louis Post-Dispatch. When he heard that the Statue of Liberty was about to die from lack of funds, he saw his chance to take advantage of three distinct opportunities: to raise funds for the statue, to increase his newspaper's circulation, and to blast the rich for their selfishness. Pulitzer set the fund-raising goal of the World at $100,000. In its pages he taunted the rich (thereby increasing the paper's circulation among working-class people) and firmly planted the notion that the statue was a monument not just for New York City but, indeed, for all of America. Perhaps Pulitzer's cleverest ploy was the promise to publish the name of every single contributor in the pages of the World, no matter how small the contribution. The editorial that opened the fund-raising campaign set its tone. He wrote: "The World is the people's paper and it now appeals to the people to come forward and raise the money [for the statue's pedestal]." The statue, he said, was paid for by "the masses of the French people. Let us respond in like manner. Let us not wait for the millionaires to give this money. It is not a gift from the millionaires of France to the millionaires of America, but a gift of the whole people of France to the whole people of America." The circulation of the World increased by almost 50,000 copies. African-American newspapers joined in the effort, encouraging their readers to contribute to a monument that would, in part, commemorate the end of slavery. So the money poured in, from single-dollar donations from grandmothers to pennies from the piggybanks of schoolchildren. On June 15, 1885, the Statue of Liberty - inside 214 wooden packing crates - arrived at Bedloe's Island. On August 11, 1885, the front page of the World proclaimed, "ONE HUNDRED THOUSAND DOLLARS!" The goal had been reached, and slightly exceeded, thanks to more than 120,000 individual contributions.